After a brief direct/retrograde pivot at the border in April, 2011, Neptune slipped under the waves of its watery home sign of Pisces for the approximate 13-year duration in February, 2012, washing off the electric burn of Aquarius and relishing the depths of its cool kingdom. An ingress such as this is always a profound moment in mundane astrology because Neptune wields a lot of influence in this world. It is in the nature of Neptune to operate very quietly, however, like a submarine that glides invisibly beneath the surface, so we’re not always well aware of the “drag” produced by its movements, and we’re always left to wonder if its energies will manifest in ways that are benevolent and uplifting, or subversive and insidious. There’s no intellectualizing Neptune’s pull; it must be “felt into.” More often than not, its significance simply “dawns” on us at some point. Given the spiritual, resurrection/rebirth symbolism of the Easter season (the ultimate Neptunian celebration), it is perhaps significant that this Easter morning dawns with Neptune in Pisces rising in the world's 12th house—its energies as emergent on the world scene as its symbolism is in the day’s Christian liturgies. I am struck by the message of this particular rising Neptune, however, so this post will explore its significance for the volatile situation we find ourselves in these days. First, a few thoughts on Neptune’s modus operandi. Neptune pulls us down into our depths and dis-“illusions” us—it undermines our ego assurances that we are somehow “separate” and thus safe from the dangerous forces “out there.” Even those who welcome Neptune’s redemptive, enlightening force as part of a spiritual quest can’t help but feel a bit exposed by what they’re seeking: the loss of boundaries between our Self and Others never fails to register as threatening. We’d like to feel “ready” to walk into that Light; we know we’ll get there eventually, but does it have to be now? Neptune’s promise of cosmic redemption and enlightenment mean different things to different people, of course: Buddhists seek Nirvana, Muslims long for Paradise, Christians see themselves at the “Pearly Gates” of Heaven, and Jews prefer to be flexible on the matter, putting their focus on the here and now. Those who find “God” in Nature (indigenous peoples, pagan/wiccans, Taoists, spiritually-inclined environmentalists) find meaning in returning to the earth when their time comes. Even those with no particular spirituality feel the need to belong to something more all-encompassing and more uplifting than their separate, ego-driven existences, in the end. We are all subject to Neptune’s longing, one way or another, so we join causes, we embark on romantic quests, we work to leave a legacy of sorts—our “Kilroy-was-here” mark on the world. In other words, we seek meaning in our lives. Not surprisingly, Neptune transits can challenge us to question, at times to lose track of, and ultimately, to deepen our sense of that meaning. Sometimes we get lost in the undertow—addiction is a treacherous Neptunian path for millions. These depths can be dark, indeed. Whatever form our quests take, Neptune’s challenge operates on all levels—personal and collective. Nations can lose their sense of direction and succumb to Neptune’s darker reaches as easily as individuals can. Terrorism is a particularly twisted Neptunian phenomenon—more on that to come. Let’s pick up the story unfolding on the world scene this Easter morning from here. Chart 1. Easter Sunrise, April 16, 2017, 5:02 a.m. DST, Greenwich, England. Between tensions produced by the globalized economy and climate change, humanity (Moon) is flirting pretty heavily with Neptune’s oblivion. There are tipping points on the road to oblivion, and one of those has been marked by the emergence of terrorism—a pernicious geopolitical force that functions like an autoimmune disease (also Neptune-ruled). These nebulous, difficult-to-diagnose diseases take hold within an organism’s immune system, which then attacks the tissues and cells it is meant to protect because it recognizes no difference between threats within itself and those from outside. In regards to the terrorist threat, the more we go after it with our law-and-order driven, Saturnian “retribution” logic, the more insidiously the phenomenon takes hold. By twisting the deep-rooted archetype of martyrdom, terrorism weaponizes victimization—people don’t strap themselves inside a suicide vest on a whim. Terrorism is the ultimate Neptunian strategy from start to finish; inspiring fear and retribution are its most effective tactics. This Pisces-Sagittarius configuration here suggests that the world has an urgent need to heal the deep currents of pain, resentment and passive aggression that fuel terrorism. Without justifying anything, we can come to grips with why this phenomenon emerges, when and where it does. It always seems to have its roots in societies that are marginalized and disenfranchised in some way. Or in people who simply do not see eye-to-eye with western capitalist logic: those who have get more; those who have less, lose even that little bit. Not that capitalism can’t work well for people, too—the problem is its natural tendency to sort the world’s people into increasingly unequal camps of “winners” and “losers.” There’s no denying that globalization has lifted some boats, but it’s also imperiled large swaths of humanity caught up in economy-driven turmoil, and it’s enslaved millions more (the short-term profit motive beats all). It all fuels more terrorism and social upheaval, and rarely (if ever) heals a terrorist threat. 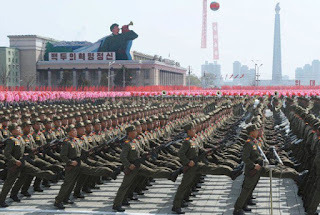 In the case of North Korea, a desperately poor country that distracts its people with military parades and shrill claims of victimization by the capitalist world, keeping their elites well-fed and their “glorious leader’s” ego massaged seems to rely totally on the threat of using nuclear weapons. 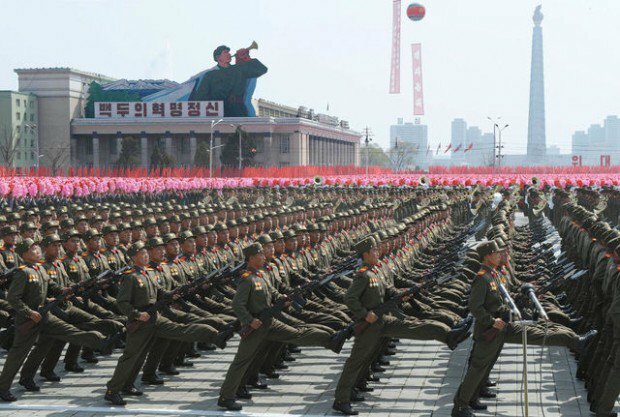 They are parading new ICBMs and launchers as I write this. This threat is intended to hold the entire world hostage—and Trump’s promise to “solve North Korea with or without China” is little comfort. Not that we should discount threats posed by players like North Korea (a chart we'll discuss in a future post), but there is a fundamental principle at the core of all these dilemmas: that ignoring the imperatives of compassion and fundamental human rights profits nothing in the end, unless we’re okay with life in a perpetual state of war. It’s human nature: people will blame others when their lives are radically limited by injustice, greed and corruption; on the positive side of it, even a small opening in the door of opportunity, and a modicum of support and fairness, goes a long way to calm people down. Which future is Trump preparing us for by trying to slam shut our borders and build up our police state capabilities? Despite all these perils, nobody puts on a better magic show than Neptune, and for some would-be power players, terrorism is a gift that keeps on giving. What better way to justify shutting down democratic institutions and tilting the checks and balances toward “strong-man” executive rule and corporate hegemony? We take comfort in “Father” ruling with an iron fist when times are scary, and somehow times always tend to get scary at opportune moments for such “Father” figures. Neptune is not above subterfuge and subversion. War is “good for the economy,” the story goes. First house Venus and Chiron (Pisces) chime in that the world is in need of serious healing these days; the square with the passionate Sagittarius points (Moon, MC, Saturn) caution that we're pushing the limits of volatility for the sake of image (MC), pride and adventurism, and these things rarely go well. Perhaps we shouldn’t be surprised that these points conjoin Trump’s natal Moon (chart not shown). Who will speak for the power of love in today’s world? Will they be laughed off the stage? Sun-Uranus (Aries) trines Moon-MC-Saturn (Sagittarius); Ceres-Mars (disposing Sun-Uranus from Taurus) sextiles Venus-Chiron (Pisces) and inconjoins Saturn. Still at the Galactic Center, this fiery Saturn suggests that incriminating information will continue to emerge—which it is doing, on an almost daily, drip-by-drip basis. So, what better way to distract attention from this information than to drop the “Mother of all bombs” on ISIS this past week (an appropriately “big bang” for the Galactic Center)? But why choose what Christians consider “Holy Week” for this attack? Was it to avenge the Palm Sunday church bombings in Egypt this past week? What’s wrong with this picture? The “Mother” was a multi-purpose attack, in fact: it was an aggressive action and stance (Sun-Uranus trine, enabled by Mars’ inconjunct) that sent a “message” to belligerent North Korea and racked up “presidential behavior” points in the process. Those who felt Trump finally stepped up to his job by dropping bombs seem to be looking for the Old Testament approach to foreign affairs—suffering no quarter, bringing hell fire down on the heads of infidels and all. Presumably, these are the same people who see “bombing the #*it” out of an enemy as making America “great” again. Again, on Easter weekend, what’s wrong with this picture? Ceres-Mars also reflects how the earth (and agriculture) is torn up in such attacks, but through it all, Trump’s aggressive late Leo Mars (chart not shown) is enjoying the testosterone boost. His Mars forms the third point of a grand fire trine with the Aries and Sagittarius energies on Easter day—perhaps a “resurrection” for his polling numbers? Jupiter (Libra) sextiles Moon (Sagittarius), squares Juno-Pluto (Capricorn); Jupiter quincunxes Neptune-ASC (Pisces). We also can’t miss the fact that this chart’s Jupiter falls exactly conjunct (within minutes) Trump’s natal Jupiter—despite considerable resistance and investigations, etc., he’s still enjoying tremendous latitude and backing for whatever power plays he has up his sleeve. This particular aspect suggests that the finance industry (Capricorn Juno-Pluto) is a supportive partner. All of this impacts Neptune’s “message” in this chart: the tensions injected into world politics and economics by would-be power brokers (Jupiter square Pluto) are palpable, and for the moment, these players are wielding considerable clout (Jupiter disposes Sagittarius points and co-rules Pisces). If history demonstrates anything, it’s that there are times when all roads lead inexorably to war because the energies are simply flowing that way, despite the total irrationality of the idea. There are unfortunate signs that this is one of those times, but let’s not give this thought any more energy than it deserves. The Jupiter quincunx we see here suggests that there are vested interests at stake in today’s geopolitical dilemmas, and the pressure is on (waning square to Pluto) to make good on promises and goals. In Libra, it’s possible that Jupiter will support diplomatic solutions, but this could be outweighed by the ego-satisfying way in which heavy-handed measures are applauded. Let’s hold out hope. Mars-Ceres (Taurus) sextiles Venus-Chiron (Pisces) and trines Pluto (Capricorn). The Taurus-Capricorn trines suggest that the ambitions of key power players extend to territorial acquisition, which makes sense, given prevailing geopolitical dynamics. Russia is keenly interested in expanding its territorial reach (think Ukraine and Syria; they’ve shown renewed interest in Afghanistan lately, as well). According to reports by Reuters and others, Russian oligarchs have even been busy investing in Trump-branded luxury properties in New York and Florida—acquisitions that open up all kinds of possibilities for them. The sextiles to Venus-Chiron may be somewhat hopeful, yet as we’ve seen above, this is the season of “hard,” not “soft” power like theirs, and we should probably be aware that the powers-that-be will attempt to play on our emotions for their own materialist (Taurus) purposes. Will we know when to believe (Pisces) and when not to? Neptune rising in Pisces represents a fullness of potential, a sort of critical mass—“the minimum size or amount of something required to start or maintain a venture.” It’s the one extra drop of water that turns normal rainfall into a flood; it’s the spark that catches onto just the right bit of dry kindling to start a raging fire; it’s the one extra gram of fissile material that turns a chemical reaction into a nuclear explosion. It’s the one extra tug of ego that sets the world on fire. Yet, perhaps it’s the one cool head that prevails in stormy times. How do we think about redemption and spiritual rebirth one day, accepting a gruesome plan like that on the next? So the critical mass Neptune seems to be calling for is one more voice, calling out for love and compassion—the New Testament way those celebrating Easter this Sunday claim to embrace. May loving voices prevail. Beautifully written. I have Neptune conjunct my moon right now and i want to weep for the world.